We are offering the crane solution with impact to easy material handling and low price of operating as well as capital cost. We have developed the specially bearing housing to reduce the power consumption. 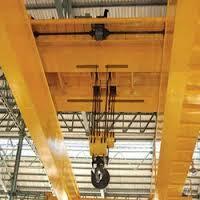 We supply all type of overhead cranes, like single girder, double girder, zib crane as per span suggested by customer. The capacity of cranes is up to 100 MT. Ladel transfer car (Remove word ladel and consider Transfer car. The Transfer car specially design with rigid construction, Bearing housing arrangement and top bad is as per custom requirement. If is operated by geared motor with cable reeling drum arrangement. Also, we can supply as per customer requirement. Capacity in Ton 1, 2, 3, 5, 10, 15, 20, 25, 30, 40, 50 etc.